Last year, I wrote about how quickly fall had approached. I share this same sentiment today, as I write about this year&apos;s Heartland Apple Festival at Beasley&apos;s Orchard in Danville. I&apos;ve written about the orchard and this fall attraction - a true tradition for my family - so many times. We love it so. Beasley&apos;s Orchard in Danville will bring the fun back again during its annual Heartland Apple Festival. If you&apos;re a local, you&apos;ve surely heard about or experienced this fall tradition. If you&apos;re a visitor or have never heard about it, you must check out this fantastic two-weekend event held the first two weekends in October every year. The Heartland Apple Festival has become a tradition for my family. It boasts something for all of us, and it always comes when we are in dire need of some time together, outside, enjoying the simple things. School, sports and other activities may be back in full swing, but I&apos;m always eager for a little break from the mundane. Between my family and our friends&apos; family, we had six children - including 2-year-old twins, a 9-year-old, and three teens - in tow when we visited last year. Everyone enjoyed every minute of it. Needless to say, we&apos;re looking forward to this year&apos;s event. Beasley&apos;s has opened a u-pick section. So, now families can pair the fun of wandering a portion of their extensive orchard with all of the other activities, which just adds a whole new dimension to this wonderful event. Sometimes we just need a time and a place to take it all in and enjoy the season. 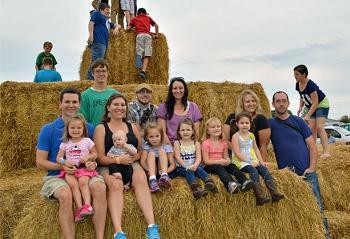 Beasley&apos;s corn maze and hayrides are a perfect way to do just that. The corn maze design changes every year, and navigating it is a challenge the whole family will enjoy. Last year, our family navigated the maze once at the Heartland Apple Festival, and again during their Dog Daze at the Maze festival. I couldn&apos;t help but think back to years when we pushed a stroller through the maze or had tiny tots who scoured the land for muddy puddles to walk through with no interest in reaching the finish point of the maze. Now, we have teenagers who argue about which direction the clues are indicating, but somehow find the end in record time. It really doesn&apos;t matter what phase of life your family is in, the enormous corn maze at Beasley&apos;s is a fun tradition for all. 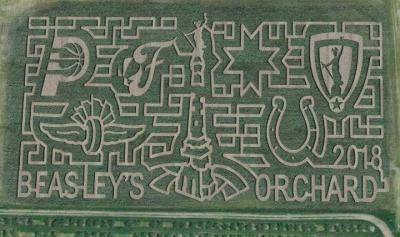 Side note... take a minute to look at the photo gallery, inside the market, of past corn maze designs at Beasley&apos;s. It&apos;s pretty amazing. Last year, we visited during both weekends of the festival and picked the hottest day to take a hayride out to the U-pick pumpkin patch. Our boys probably would have preferred to stay in the Barnyard Bonanza to shoot hoops, but they jumped up on the hay and posed for pictures just as my heart had hoped. Once the tractor started moving, however, their faces revealed what I really hoped for -- simple joy. We found the perfect, albeit heavy, pumpkin. We were all grateful for the hayride back to the barn. But the fun doesn&apos;t stop there. Beasley&apos;s also has added apple cannons to their ever-growing list of fun. Fire apples from air-compressed cannons and try to hit the target. We bought a bucket full of apples to start last year, but quickly went back for another. They&apos;ve even added metal targets to make it even more enjoyable. 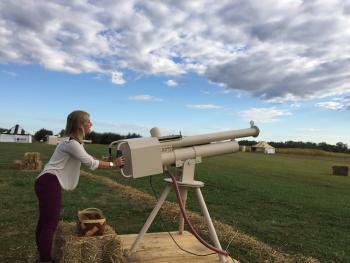 Whether your young or old, shooting apples from a canon is guaranteed fun. Beasley&apos;s Orchard boosts a beautiful, well-preserved barn that serves as their market for the whole season, not just the festival. I love walking the market and shopping the host of local items such as teas, decor, pantry items, gourmet foods and of course, their fresh produce. Additionally, this is the perfect time to get all those fall staples: mini pumpkins, mums and Indian corn. You&apos;ll be itching to set your Thanksgiving table. Outside, stroll the outdoor craft vendor market for a little bit of everything. And it&apos;s all good. Last year, I left with specialty treats, bandannas for the dogs and homemade body butter. Naturally, folks come for the eats. It&apos;s an orchard, after all. Our oldest makes his way straight to the counter at the back of the barn to purchase their award-winning cider. For him, it&apos;s usually a cider slushie for now and a gallon of cider for later. Whether you prefer it hot or cold, Beasley&apos;s cider is simply the best. You&apos;ll want to leave room for lunch or dinner, too, as the food vendors at the Heartland Apple Festival don&apos;t mess around. Burgers, tenderloins and fried biscuits with apple butter are personal favorites, but there is something for everyone. I meant it when I said that this festival offers fun for the whole family. Year after year, I send my kids up the hay mountain - a big stack of hay bales... yep, simple pleasures - to pose for a picture. I love looking back at these from over the years. That mountain sure looks smaller these days. Still, it&apos;s fun for all the kiddies to climb and play. The Barnyard Bonanza family activity area provides fun for all ages. 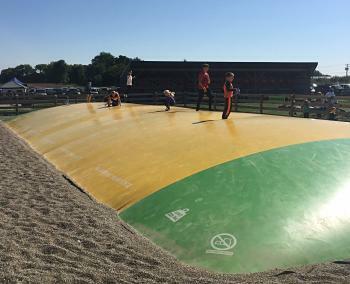 You&apos;ll find a giant jumping pillow -- sure to tire out kids, and their parents -- a spider climbing rope web, a corn crib for digging similar to a sandbox, only way cooler and a row of ball games - pitch baseballs, spin a spiral in the football throw or shoot some hoops. In the background, you&apos;ll hear live music and entertainment coming from their center stage. You&apos;ll want to venture closer for the the puppet and magic shows. Pricing Information (per person): Hayrides $4, Corn Maze $7, Barnyard Bonanza $5 and Apples Canons are $3 for 5 shots or $5 for 10 shots. My advice: get the combo pass for $12 - this includes the corn maze, a hayride, barnyard bonanza admission and 5 shots with the apple canons. That&apos;s a deal! Kiddos under 3 are free. Parking is $5. This unique event is one you don&apos;t want to miss. But, if you can&apos;t make it to the Heartland Apple Festival, be sure to visit Beasley&apos;s Orchard during this glorious fall season. I promise, once you do, you&apos;ll come back. What else can I say? This festival is simply awesome, mostly because of its simplicity. Easy to get to, easy to find something for everyone all while making memories with the ones you love. When: 10 a.m.- 6 p.m., Saturday and Sunday during the first two weekends in October every year. What: All the fall fun including hayrides, u-pick pumpkin patch, apple cannons, corn maze, barnyard bonanza family activity area, vendor shopping, amazing apples, good eats, craft vendor shopping and live entertainment.